Rudie is younger, has more energy, but he's a rookie. Wynne is seasoned, experienced, and on the verge of retirement. Kind of sounds like the plot for a cop movie, only they're dogs. Rudie, still a puppy, gets distracted by pesky rabbits hidden in the landscape. 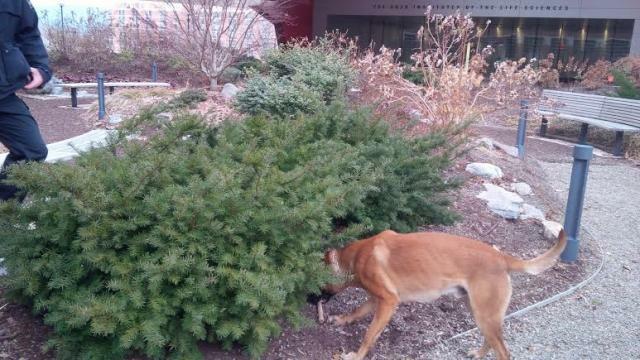 So, he takes a little longer to find the common industrial explosive stuffed down between the branches of a bush outside the Huck Institute of Life Sciences at Penn State. 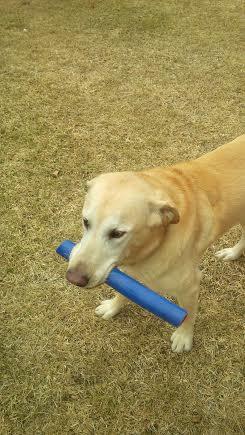 Wynne, he's done this a time or two, so it takes him about 30 seconds to find the stash. Each receives rewards for their efforts – play time with the boss, or friend. It doesn't matter what you call them – it's the same guy. 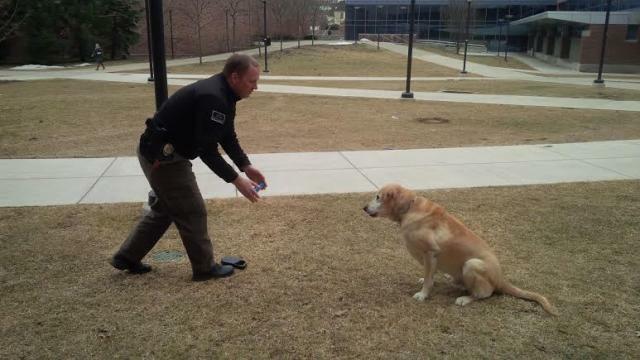 Penn State Police Lt. Matthew White, Wynne's hanlder, says his K-9 partner likes to do a victory lap before playing fetch when his "work" is done. 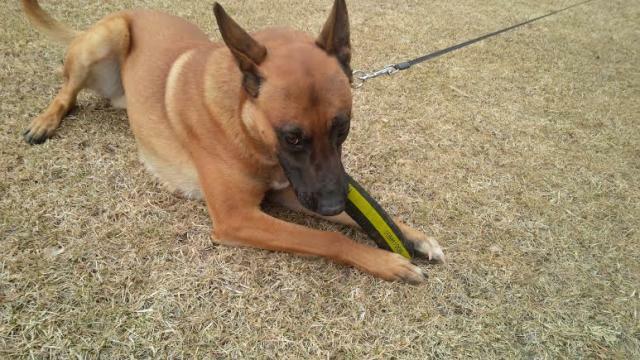 Officer Dustin Miller's K-9, Rudie, likes a combination of tug of war, fetch, and chewing. "It's a game to them. Their favorite thing is to come to work," White says. It's a game for the dogs – but it's serious work. Finding explosives or a gun used in a crime or a spent shell casing seems to be a game, but in reality, the dogs' keen sense of smell can help solve crimes, and more importantly, prevent them. The Boston Marathon, 9/11, the Atlanta summer Olympics, the 1993 World Trade Center bombing, and the Oklahoma City bombing all illustrate the need for K-9 units and bomb squads across the United States. "Stuff is out there. It's rare, thankfully, it's rare, but we don't want to take any chances," White says. 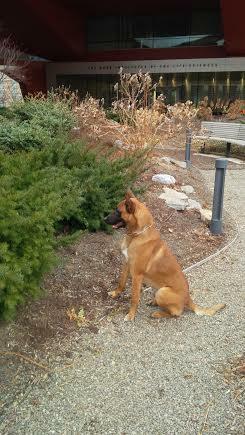 Wynne and Rudie are part of a joint bomb squad that includes Penn State and State College police. In 2013, the K-9 unit responded to roughly 30 calls for service, most of which were unfounded bomb threats and venue sweeps. Recently, the K-9 unit responded to the Lycoming County Courthouse in Williamsport for a bomb threat. When responding to a service call, the officer and K-9 work as a team. They move together, following a search pattern, as the officer looks for changes in the dog's behavior. The handler knows the dog, the cues to look for, and can see when the dog has located an explosive. "You learn to work together and bond as a team," White says. "He'll give a sharp head turn and turn into it usually. His tail will start to wag." K-9 dogs are initially trained to pick up 20 different types of explosives. But it doesn't stop there. 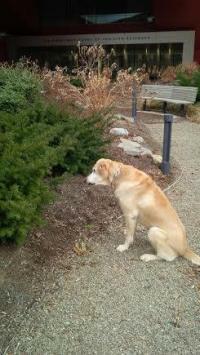 As more information becomes available, dogs are trained to detect new items. 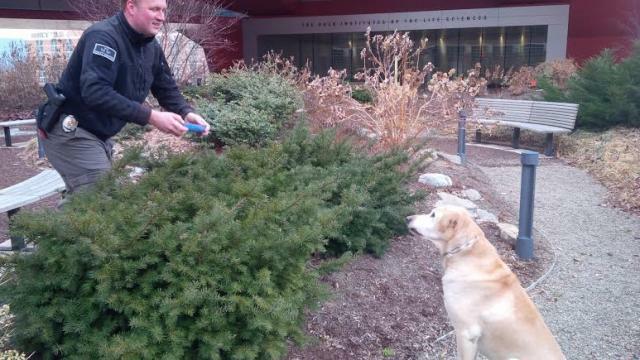 The dogs are an integral part of security for major events at Penn State. For two days before each home Penn State football game, the K-9 unit and several law enforcement agencies work together to sweep Beaver Stadium. This weekend, Rudie will be on duty at the Bryce Jordan Center for the women's NCAA tournament. 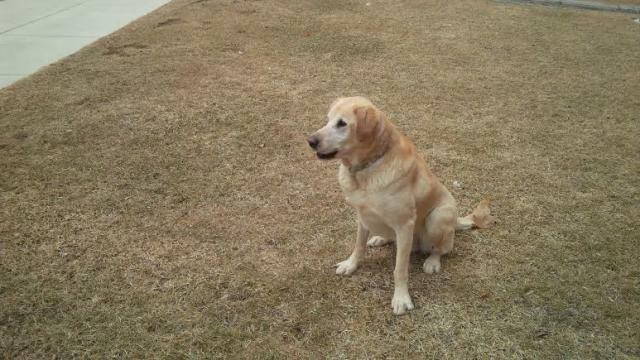 Wynne, a 9-year-old yellow Labrador, has been part of the bomb squad with White for six years. Wynne is expected to retire later this year. At that point, he'll transition from co-worker and friend to family pet for White. 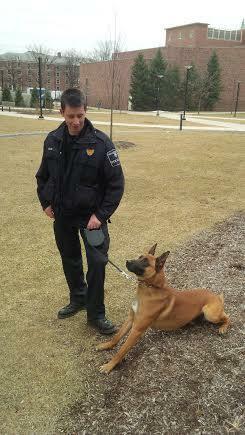 Rudie, a 2-year-old Belgian Malinois, will replace Wynne, according to Penn State Police Chief Tyrone Parham. Rudie joined the department a few months ago, following a 12-week training program with Miller through the Pennsylvania State Police Academy in Hershey. "It's amazing to watch the dogs work. ... You get to go to work and play with a dog. It's been a lot of fun keeping him up on his game," Miller says. 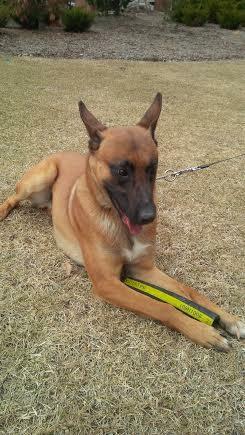 Both White and Miller serve simultaneously as patrol officers and K-9 handlers. White also serves as a bomb technician with the bomb squad. As K-9 handlers, White and Miller are the epitome of taking work home. White and Miller work with their dogs every day then take them home each night. It's a 24-hour type of job. From responding to calls to walking and brushing. "Both Matt and Dustin have tremendous responsibilities because their dogs are taken home with them. They house them, care for them, feed them, train, while at home," Parham says. "While most people, and in this case police officers, clock out at the end of the day, these officers continue to care for their dog's while at home. 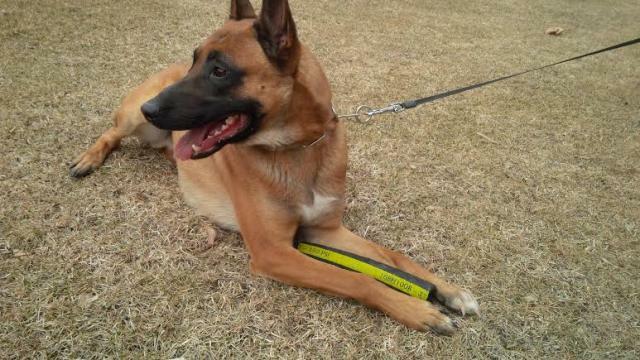 They are also required to invest large amounts of time with explosive detection training. They are also called at a moment's notice." K-9 Rudie receives reward for finding explosive. Ruide receives reward for finding explosive. Lt. White is about to reward Wynne for finding explosive. Lt. White and Wynne play after training. Redecorating and updating your home doesn't have to drain your wallet, take up all your time or require you to knock down a kitchen wall. 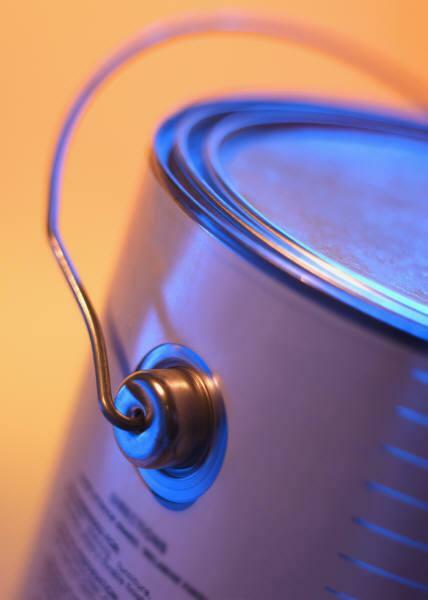 Instead, sprucing up your home can be as simple as do-it-yourself re-purposing projects from items around your home or pieces from thrift stores.